Save 15% on complete kits! Prices shown reflects 15% discount. Offer does not include refills or enhancer. Self-curing adhesive system for bonding to all intraoral surfaces, including enamel, dentin, porcelain and metal. 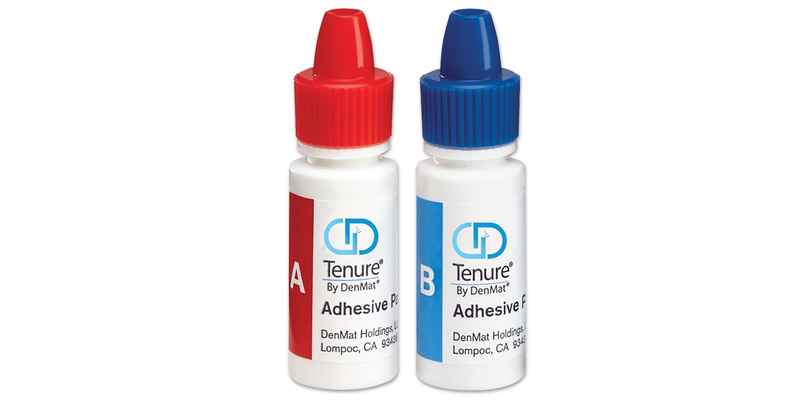 Kit includes Tenure S, a single component, light-cured hydrophilic agent that further enhances the required bonding strength needed in more difficult clinical cases. Contains: 1 x 6ml bottle each of Tenure A and Tenure B, 1 x 6ml Tenure S Bond Enhancer, 1 x 3ml syringe Tenure S Filled, 1 x 3ml syringe Etch N Seal, 2 dappen dishes, 6 syringe tips 18g, 60 brush tips, 1 brush tip handle, and 1 All Surface Bonding Chart.